It may not seem like much, but if you ever dreamt of reliving your childhood, or visiting some of those oft imagined fairy tails from some long forgotten dream, then French production house Spiders Studio may just have the game for you. 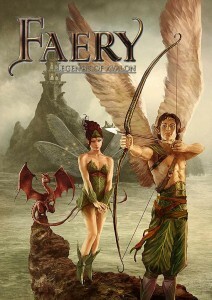 Read on to find out how the legend of Avalon lives on in Faery. 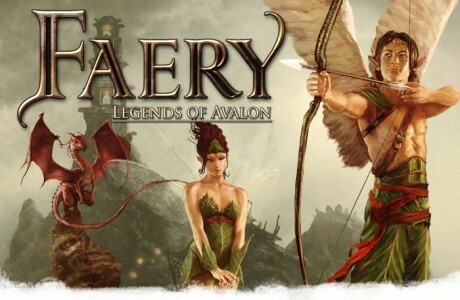 Publishers Focus Home Interactive, have a curious beast of a game on their hands with Spiders Studio breakthrough game Faery: Legends of Avalon. A gentle, charming game for the young at heart, it lends elements of role play, as well as text-adventure but also turn based combat more often seen in Japanese RPG. To be fair the whole concept is closer to the point and click adventures of days gone past, wrapped up in a loving art style and 3D animations- and yes, it is a game for girls. Magic has left the world(s) as man has moved outside of the realm of creatures and wishful thinking and slowly all the places that used to be full of such delight are being faded away into non-existence. The King has awoken you from your sleep to visit these worlds and find out why and how to stop the disappearance of all things magical. 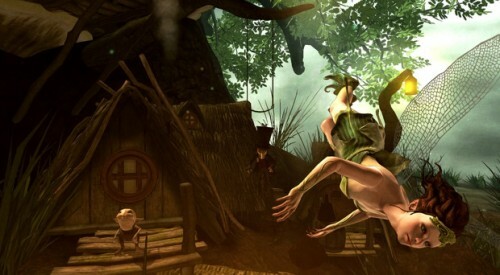 Played from the 3rd person view of a flying nymph, there are 5 worlds to visit, each based on a mythical or fairytale location. Despite the fact that there is a lot of text to read through, and the turn based combat, while good- can be avoided entirely, Faery:Legends of Avalon does a number of unique things right. Weather or not you like the idea of playing as a pint sized creature, the perspective of the game is one of being very very small. It makes the game all the more interesting, when Seagulls can become ‘boss’ monsters and even small animals like ants are reasonably large. Playing through such imaginations as The Flying Dutchman or a giant Celtic tree of life brings new meaning, when you finally meet Humans and they are the size of the screen, trees and pirate ships come to life with the ability to literally fly to the top in between each and every leaf. Another way, to spin it is, if you like the genre of high fantasy fiction then chances are you may just like this, but with a French twist all of it’s own. The production is obstinately European taking liberty with some of the best myths like the Flying Dutchmen, Oberon King of the forests and even Shakespeare and a number of other personality. Faery is not the longest game, padded out with some simple combat mechanics and a lot of side questing and although Spiders Studio obviously care about their IP the polish is not quite there. The constant flying, may take some getting used to, but for all intents and purpose it works well, despite an obvious lack of physics and animation. What is perhaps more dull than the tedious reading of so much text is the combat. There are 6 companions you can have at any one time, but swappable so that only 3 are ever in combat. As expected, enemies and AI take it in turn to attack each other, cause DPS and can buff with healing and magic. Obviously, some care has been taken as there is a lot more depth than meets the eye, but Spiders have made it simple enough that everything fits into categories of Iron,fire,water,electricity and healing. Rather than actually level your character, you can assign “metamorphosis” to your character each level which includes additional wings, horns a tail or tattoos that buff and change the levels of your resistance or damage with the elements. This is not as compelling or smooth as Fable III and results in not much more than dress ups, with each enemy weaker to a different element. Further more combat can mostly be avoided all together and this is where Spider Studios fall flat. As an arcade game, and with only 12 achievements, Faery: Legends of Avalon just doesn’t know where to sit. Each island area consists of a long list of fetch quests, reading copious amounts of poorly written English, until an area is clear and you move onto the next. Fighting has been included for those who want it, but the puzzles of combining objects to solve quests and consistently flying around can quickly become tedious for anyone over the age of 10. The levels themselves are rather small but well conceived with a beautiful art style. You would think, that with a basic understanding of the English language and so much text, in-game the developers could have used spell check. Given the turn based nature of combat, at first glance you might be forgiven for thinking that this is a Jap-Euopean poorly translated port. Truly, within minuets of playing the spelling errors and grammar became apparent. Despite this, there is a very “cute” backwards manner in which all the creatures and magical beings speak. The point about an adult being present, is well made though ,as not only will a youngster require someone to talk them through it, it may just be more enjoyable. The game is written like a bed time story, but hinges largely on better than average graphics. The graphics employ cell shading over some detailed characters, with very unique and identified creatures including the half Human/Elk King and a large number of very small nymphs, gnomes, fairies, fawns and birds. As with other games that use this method though, issues arise with the cell shaded graphics and mix of low and high polygon models. Because of the nature of cell-shading; there is no brightness or contrast settings in the game. This can mean that at times the colours look either too dark or muddied as the dark outlines accent blurry or flat textures. The actual detail still exists in the models though, with uniquely crafted animals and AI partners. It may also be the first 3rd person game where you can swap your wings for butterfly, dragon fly or bird wings. Avalon is a very bright place for all intents and purposes and truly the more you play the game, the more you may fall in love with the levels. What starts out as a pretty average island level of sand and water, turns into a giant tree of mushrooms and little people living inside, where literally an intrepid explorer can fly up between each and every leaf. Although the levels are rather small and can be traversed easily whilst flying, they stand as set pieces stereotyped into “the scary level” and “the desert level”. Again there are strong elements of Fable throughout and perhaps rightly so as the game was clearly designed in Europe. Clearly, Spiders Studio have put a lot of love into the game with well thought out levels and characters. Further, and borrowing directly from other games like Mass Effect, all the text and dialogue can be either good (blue) or bad (red) resulting in less or more love from your friends. When they love you enough, things get awkward and then you are presented with a gift of armour or weapons. This copy and paste though of ideas is evident throughout the game, as there is never ever any incentive to say the “bad things” and at times, will result in being unable to complete missions (because the character hates you). In fact this is rather redundant and flawed gameplay mechanic smacks of Spiders trying to do too many things at once. It would have been nice, if Spiders put some more effort into combat animation and effects for Faery, as well as cleaned up the dialogue and love/hate idea, rather than taking them on as an afterthought. Clearly it wants to be a game for young children, but tries to balance some more ‘grown up’ ideas in with mixed results. In a game like Faery, sound is relative, as one could argue the game is rooted squarely in either text based or point and click adventures. With that in mind, the insistent lack of dialogue or any voice acting is forgivable; however given the rest of the production perhaps music and effects, is not. If there is particular music for combat or even a game theme tune, it is hardly remembered as the most obvious sound comes from the beating of your wings. This can in fact get rather annoying, but eventually tunes out to other noises like the birds and grunts of animals. To be fair, it is hard to fault Faery for not having ‘sound’ as this is obviously a deliberate and “artistic” choice. It works to focus the senses on reading the text and looking at all the pruurdy graphics. Anyone young enough to be interested may get bored, but may just skip all the text anyway. If you measure value, by the sheer size of file then Faery: Legends of Avalon is an afternoon delight. Weighing in at under 1GB there is a lot of full 3D graphical bang for your buck. On top the game lasts for anywhere between 10-15hrs, although as stated it is quite possible to get very bored long before you finish it. There are 12 achievements standard and a price point of 1200MSP which is reasonable considering the quality on offer. That said, try before you buy because the game really is not for everyone and only those who know exactly what to expect should consider purchasing. 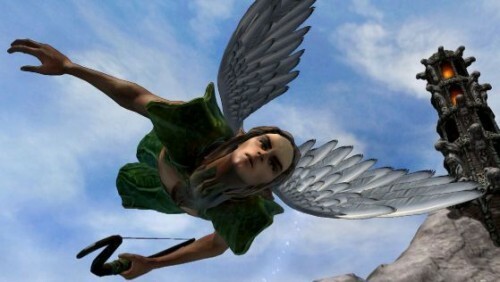 Also, sadly Spiders have not included any avatar awards: To dress up your Avatar like, well, a Faery. When an unknown studio tries, at least tries to emulate some of the great gameplay from today: including evolving characters, cell shading, good/bad dialogue options and even turn based fighting- props to them. Inidi production crews deserve all the compliments for taking an idea and running with it. Unfortunately, the core of Faery really lies in the innocent nature of storytelling and text quests and does not need the added confusion of combat and “role playing” and romance. Someone should tell Spiders Studio that it is ok to make games for girls and ok to make games for children. A lovingly crafted game, that is bigger than the sum of it’s own ideas, an enchanting tale but one that may ultimately- put you to sleep.